The error may happen anytime during usage of the app. The error is most likely caused by insufficient shared memory that is available for the database engine usage. 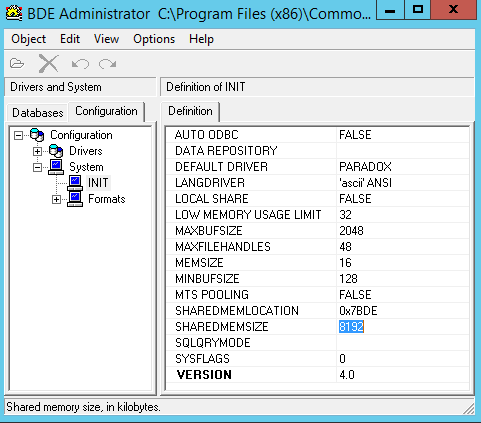 Thus, the resolution for the error is by increasing the shared memory available for the BDE. Search for and open BDE Administrator. Modify and enter the value of SHAREDMEMLOCATION and SHAREDMEMSIZE according to the amount of physical memory (RAM) the computer has, based on table below. The changes are saved automatically. Restart the computer when done for the changes to take effect.